How often have you wished for a stand-alone HDMI test set? DVM-HDT-KIT GENERATOR is part of programmable HDMI UHD (Ultra High Definition) Test Instrument family of products and is in functionality Pattern Generator, packed with features for video and audio testing of HDMI® sources, sinks and repeaters. DVM-HDT-KIT GENERATOR generates full range of resolutions with its maximum of 4K@ 60Hz 4:2:0 signal which is recently defined in HDMI® 2.0 specification, and does generate all actually available HDMI and DVI digital signals. DVM-HDT-KIT GENERATOR has built in 3.0” (inch) LCD display that will show graphic implementation of actually generated Pattern and settings menu, including output signal settings & parameters. Professional, programmable sine wave generator is integrated for performing sophisticated audio tests and when need for specific stereo audio auxiliary audio source to be embedded into HDMI® output, 3.5 mm stereo socket is available on rear panel to be connected to practically any unbalanced 1V/pp stereo analog audio source. The DVM-HDT-KIT GENERATOR is highly programmable via RS232, USB or TCP/IP with included PC based Control software. For purpose of creating large test systems with multi device measurement protocol functionality, customers can use the RS232 output to connect to next unit. Thanks to this functionality, users can set up a large test system with multiple DVM-HDT-KIT generators to test UHD distribution devices or complex UHD networks. 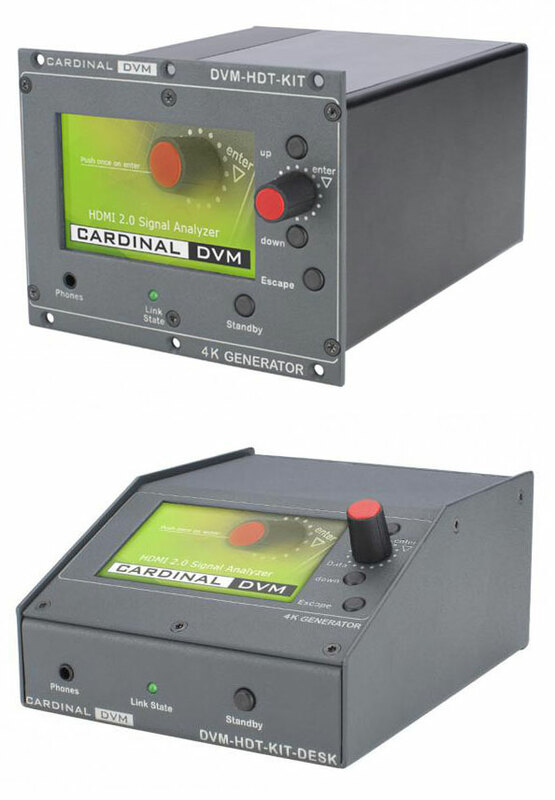 Two versions are available both with Analyser and Generator, either rack mounted (top) or portable (bottom) shown opposite.